Testimonials | Australian Carob Powder | Wholesale Carob | The Australian Carob Co. The Australian Carob Co have produced a carob powder that is exceptional in taste and with a luxuriously fine texture. I am a carob lover from way back and I feel like I’m tasting carob for the first time, it’s honestly that good! They treat carob product making like a fine art and their passion and dedication have paid off with a product that exceeds all expectations. Hearty congratulations to the geniuses on The Australian Carob team. The Australian Carob Company’s products are rich in flavour compared to any raw carob product I have had before. My clients and I are very glad to support a quality Australian product. The Australian Carob Company products are of exceptional quality. Not only are they flavoursome and delicious, they are also high in nutritional value. The carob syrup in particular, is delightfully sweet and is perfect in hot drinks, on desserts, or on breakfast cereal! We came across the Australian Carob company for the first time at a recent Organic Expo in Melbourne where they were our next door neighbour. Not only were we amazed with the taste of the carob powder, nectar, and kibbles but we mixed it in our Hemp Protein and ‘it was like there was a party in our mouths and all the taste buds were invited’. The taste was so good that we are seriously considering adding another dimension by flavouring our Hemp Protein with The Australian Carob Companies products. It would definitely enhance the taste of any food it is added to. Absolutely love the Kibble Nibbles! They are a really tasty, healthy snack. And very moreish. Will be highly recommending to all my friends. I recently moved to Australia from Europe and I was interested in the quality of the raw products available here. I ordered raw carob from The Australian Carob co. and I was really impressed by the quality of the raw carob and kibble, it was far superior to anything I had bought in Europe previously. I am now a committed client. Michael Jolley and his wife Jam established their carob orchard over 13 years ago and have worked assiduously to then construct their processing shed and obtain processing & packing machinery. Michael has extensively researched the product he grows & processes and is now the world leader in the processing and handling of carobs. He sets very high standards for the processing of carobs and the best ways to maximize the mouth feel and taste of the product. An excellent operation that should continue to prosper. When I began manufacturing pet treats, the finest ingredients was of paramount importance. I was lucky to discover Australian Carob Company after using three other brands of carob product. The natural sweetness and tantalizing aroma of the carob powders is unlike anything available. I particularly love the creaminess of the carob buds which are chocolate like and unrivalled by anything by anything I’ve tried. My customers love the fact they are sugar free and low fat, and a treat they can share with their beasties. Organic well that’s just a bonus. I wouldn’t even consider any other carob. It is a very superior product and I have great confidence in recommending it to all chefs and home cooks alike. I just love the clean rich caramel taste that has great depth and complexity and the fact that it is a very good Australian product, that a big plus. It’s only every so often that a new product comes along that can really shake things up for a chef. Michael’s carob syrup (in particular) is just that – rich, earthy and distinctively sweet-sour. It has transformed some of my all-time favourite recipes like my classic steamed pudding, my cassia parfait, and even my kids’ Sunday morning pancakes. I even used it for a brilliant ham glaze the other night. This is one product of 2011 that every chef should be taking a close look at. Healthy Chef is a company that creates purely delicious functional foods for optimum health + wellbeing. We use organic and natural wholefoods and pride ourselves on developing quality that will inspire a deeper commitment to healthy living. It’s important to know where you’re food has come from and treat it with the love and respect it deserves. The Australian Carob Company’s roasted carob powder was one of the key ingredients used when designing our Naked Drinking Chocolat. I loved that is was 100 % Australian and created by owners that were passionate about their product. This passion came out in the delicious taste of the carob and married perfectly with my other ingredients including organic cocoa and Tahitian vanilla that I used for my European Style drinking chocolate. People recognize quality when they taste it – It’s clean and it’s pure just how drinking chocolate is supposed to be. After many years of purchasing carob powder I tasted your brand and it way exceeded my expectations. Your carob powder is so smooth in my drinks and now I don’t need to add sugar. Also when I use your roasted carob powder in my cakes I now don’t add any sugar at all and find the cakes sweet enough because your carob powder is already sweet tasting. The kibble nibbles are absolutely delicious and are now my regular snack food between meals and my toilet times are more regular and I’m losing weight due to not eating bad foods between meals anymore. Wow! I can’t believe how fine and naturally sweet your carob powder is. This does not have that gritty bitter taste that carob usually has. This is by far the best carob powder I have ever tasted and thank you for doing such a marvelous job. Our family will definitely be only purchasing your carob powder in the future. Every other carob product has nuts or gluten in it!! In the past I have not been able to have any carob products due to being contaminated with nuts and I am nut intolerant but now with your delicious carob I can finally enjoy it. Looking forward to tasting your Raw Carob Powder soon. Take Care and both myself and my family love the great products you produce. We have been using carob from the Australian Carob Company for a few years, mixing with our tea leaves to create unique tea blends. We were pleasantly surprised by how much nicer than the previous organic imported carob from another supplier. Michael from the Australian Carob Company is always responsive and product has been consistently good. The Australian Carob Co’s Premium Carob Buttons have a smooth texture and a chocolate-like depth of flavour that is just perfect for baking. They’re also finer and smaller in size than other carob buttons which makes them so versatile. My kids love them as a healthy treat and so do I – a high fibre alternative to chocolate with no added sugar. Guilt free! Australian Carob products provide a healthy but indulgent alternative when used as ingredient in the development of allergen-free foods. The products have a great flavour profile and superior quality when compared to other carob ingredients available in the market. On top of that, the follow-up and service of the company is proactive and outstanding. The highest accolade I can give is to say your peppermint carob buds are as delicious as Haighs peppermint truffle bars, yet afterwards, I feel as healthy as carob. I used to eat carob as a healthy chocolate alternative, now I have discovered the Australian carob company, I eat it because it tastes so delicious! The Australian Carob Company’s raw carob is simply delicious. With it’s soft, caramel flavour, I find this carob to be a beautiful standalone flavour in my carob coconut rough. It also pairs really well with other flavours such as cinnamon, vanilla and cacao powder giving my other ‘chocolately’ treats an exotic, caramel undertone. This carob powder has a much finer and delicate flavour than other brand’s of carob powder I’ve used which means a much smoother flavour. I love it and so do my customers! The Australian Carob Co. carob is a terrific high quality Australian carob with powerful benefits and amazing taste. We only use the highest quality products in our raw chocolate and the Australian Carob Co provide us with the best raw carob we have found. I recently came to Australia for a holiday from England and took back home some of your raw carob powder. This is the best raw carob powder I have ever tried and my friends all love it to. Look forward to seeing your products available in the UK so we can all enjoy this great product every day. Definitely the best tasting carob products I have ever tried! 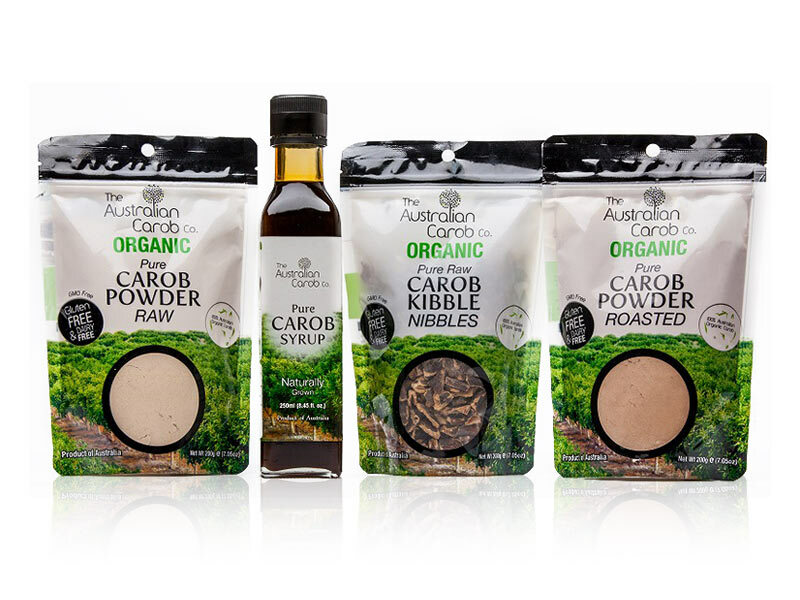 I have travelled many countries and could not believe how good the raw carob powder, carob syrup and carob kibble nibbles taste in Australia. I eat carob every day now and I feel better than ever before without so many health problems. Thank-you The Australian Carob Company for making such top quality carob products because I love them. My whole family loves your raw carob – it is not bitter like others we have tried. We have it in almond milk (which we make – just soaked almonds, distilled water and celtic sea salt) and do not even need to use honey! Sometimes we add half a vanilla bean, but not always. We also like the fact that we are buying Australian! Our local health food shop ordered the raw carob powder in especially for us and now stocks it and some of your other products. My children like the carob kibbles too. Wish we lived closer so we could visit your farm. I have tried a few other carob powders but this is the best of all. The flavour is just amazing. Don’t expect Cacao, this is a totally different product. Once you start on the kibble you will nibble more than you expect. Only the freshest and the finest! The distinctive flavour is simply irresistible. I was diagnosed with a rare disease only 131 persons in the world have, I had to have 4 major operation last year and as one of the consequences I had HUGE digestive problems. All the gurus, specialist etc could not help me… I went to Israel and as a treat I nibbled on carobs (SO YUMMY). An every day treat there. For two weeks I felt fabulous…not a pain … my digestive track…working…mmmm…very strange. Came back to Australia and all the old problems returned. My husband questioned me about anything different I had done whilst overseas. I could not remember anything in particular except this.. I thought no way…it can’t be this.. Customer service is excellent with fast response times both logistically and in delivery, very professional and regular follow-ups on how things are going. I ordered 1 kg of your carob pods yesterday and they arrived today in the mail. I was interested in seeing if I could eat carob (since becoming ill and struggling with food and chemical sensitivities) after I watched a YouTube raw low fat vegan site where they talked about how cacao isn’t good for you (I get headaches when I eat raw, organic cacao beans) and that carob is a really good substitute. I hadn’t thought of carob before as a sweet dessert option for me. Before becoming ill, I had lived and travelled all around the world and have tried fresh carob pods in many countries and frankly, I haven’t been that keen on them in the past. But after i found out that you don’t spray organically certified chemicals on your carob trees, I was keen to buy some. I generally have to even steer away from alot of “organic” food because organic growers are still allowed to use chemicals like sulfur, zinc, copper, dipel, entrust, pyrethrium etc and I have found that I get headaches if I consume the skins of organic fruits and vegetables which have been sprayed with these “organically certified” inorganic chemicals. i’m so lucky i’m able to grow alot of my own vegetables and I generally peel even organic fruits and vegetables that i buy if i’m not sure whether they’ve used “organically certified” sprays. Anyway, when I tried your carob pods today i just could not believe how absolutely amazingly delicious they were. They smell like carob, but they taste like a chewy, caramel wafer/waffle or a sweet caramel chewy candy. Yummy. I have to say that it’s one of the most delicious food items i’ve eaten in the last three years (and my food is very delicious because of all of the amazingly flavourful organic fruits and vegetables that i eat). And i’m thrilled to report that although I went a little berserk with eating alot of them (while fighting off my puppy princess labrador ash who also has a fondness for them), 8 hours later, I don’t have any headaches. So I just wanted to express my appreciation for your product and I am sooo grateful that you have been as cautious growing them naturally as I would have to be if I grew them myself. And as an added bonus, they are SO amazingly delicious, I just cannot believe it AND they are nutritious! The Australian Carob has a sweet well rounded flavour that doesn’t compare to any other carobs available. We also really appreciate that we can get raw organic carob. This is the only carob that we can be for certain is raw. I recommend this carob for people who are sugar free who still want sweet. A superb product.